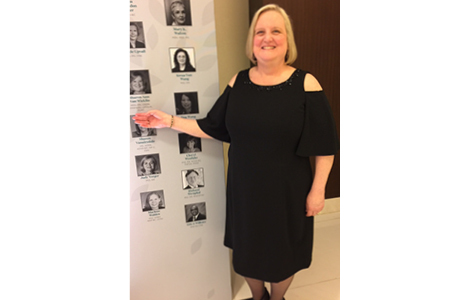 Sharon Ann Van Wicklin, MS(N), RN, CNOR, CRNFA(E), CPSN-R, PLNC, was inducted as a fellow into the prestigious American Academy of Nursing at the American Academy of Nursing fall meeting October 5-7 in Washington, D.C. Sharon is currently pursuing a PhD in Nursing from the Sinclair School of Nursing and is mentored by Vicki Conn, PhD, RN, FAAN, Associate Dean of Research and Professor of Nursing. While several PhD graduates have gone on to be fellows, Sharon is the first active student to be inducted as a fellow. Sharon is a senior perioperative practice specialist for the Association of periOperative Registered Nurses. She has more than 40 years of experience as a perioperative registered nurse and has worked in all facets of the perioperative environment from scrub person to director. In her current position, Sharon provides consultative services and authors numerous publications. She has written seven nationally-recognized guidelines for perioperative practice. The guidelines provide a foundation for increasing nurses’ ability to inform health policy at the local, state and national level while transforming the United States health care system to make it more outcome-driven and cost-effective. The guidelines directly influence the delivery of patient care, the practice environment and perioperative nursing practice. Sharon also serves as a perioperative representative on various national panels and committees that direct health policy and affect patient outcomes. Additionally, Sharon is a member of the School of Nursing faculty of Middle Tennessee State University and the University of Phoenix. Sharon received her BSN and MS(N) from Middle Tennessee State University. She is a member of the Sigma Theta Tau Honor Society of Nursing and Phi Kappa Phi. She holds certification in operating room nursing, as a registered nurse first assistant emeritus, as a retired plastic and reconstructive surgical nurse, and as a professional legal nurse consultant. Sharon was recognized as a recipient of the Outstanding Achievement in the Application of Perioperative Clinical Research Award in 2005.